The Tampa Bay Rays made an early exit from the playoffs in a year that many expected them to challenge for the World Series. Instead Joe Maddon’s team played their swan song on Tuesday night knowing that it is unlikely that this team will be the same next season. It was a series where the home team never won a game, so much for home-field advantage which was bad news for the Rays who had the “advantage” of playing in a stadium that the fans only show up to during the playoffs. According to the Elias Sports Bureau it is the first time that the road team has one every game of a post season series. Ron Washington’s Rangers ended a playoff drought that stretched back to 1961 when the Senators came to Washington as an expansion team and until Tuesday was the only MLB franchise that had never won a playoff series. The legendary pitcher Nolan Ryan the new owner of the Rangers sat in the stands savoring the moment as Washington and his team celebrated on the field while the Tampa fans filed out of the stadium. The mood in Tampa was totally different than in Atlanta on Monday when the Braves lost their series to the Giants and both teams and grateful Braves fans saluted retiring manager Bobby Cox. 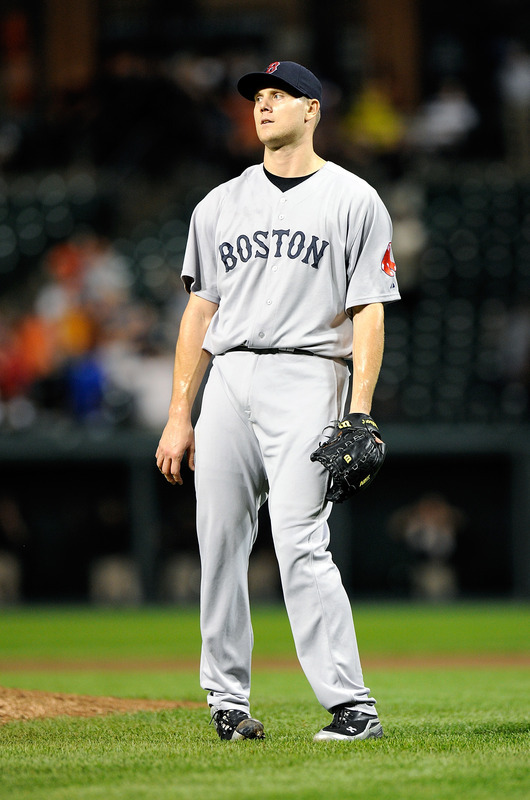 If there was no joy in Mudville when the Mighty Casey struck out there was less in the Trop as B.J. Upton popped out to left center to end the game and season for the Rays. The Key was pitching, in particular Cliff Lee who as he was in the playoffs last year with the Phillies absolutely dominated the Rays for the second time in 5 games. Lee fanned 11 Rays in a six hit and one run complete game victory and lowered his post season ERA to 1.12. 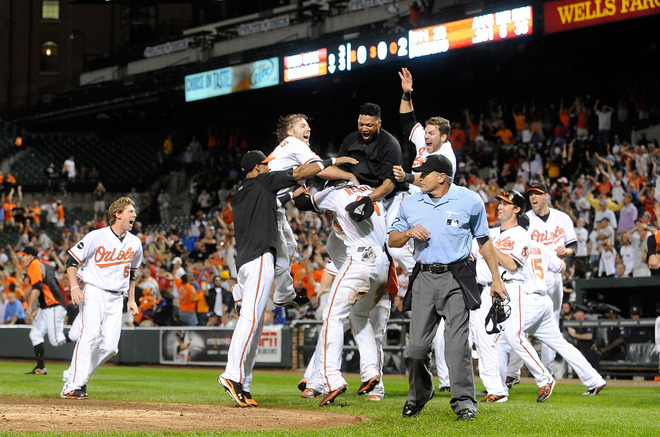 The win continued a post season where pitching has been the dominant force in every series. The Rangers used some aggressive base running to set the Rays on their heels early in the game and continued that aggressiveness the entire game. 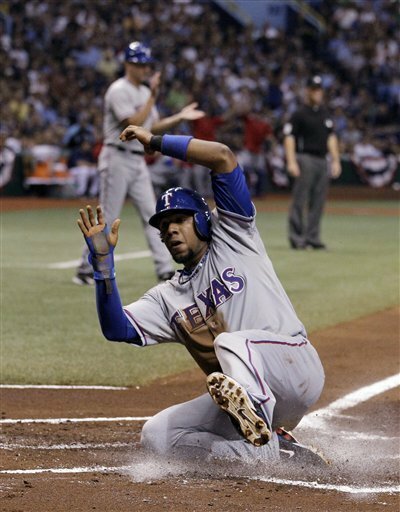 Elvis Andrus got a leadoff single and stole second base. He then scored on a ground ball out by Josh Hamilton alertly coming all the way around from second as the pitcher David Price taking the throw at first failed to check the runner. The Rays got that run back in the bottom of the 3rd inning combining consecutive singles by Sean Rodriguez, Jason Bartlett and Ben Zobrist to get on the board. 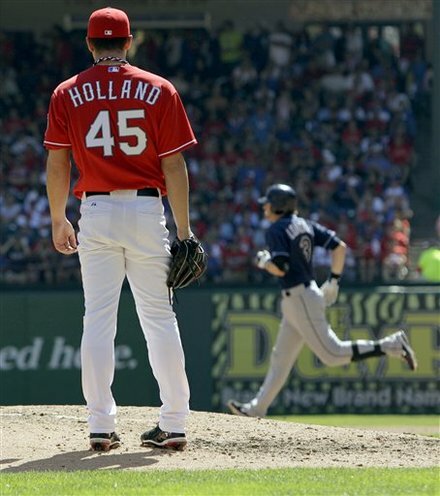 The Rangers took the lead in the top of the 4th inning when Nelson Cruz alertly scored on Ray’s catcher Kelly Shoppach’s throwing error to third which sailed high and right over the outstretched arm of Evan Longoria. The scored again in the 6th inning to make the score 3-1 using aggressive heads up base running this time by Vladimir Guerrero to get the run. With Guerrero at second base and Nelson Cruz on first Ian Kinsler hit a ground ball to first base. First baseman Carlos Pena threw to second to get the force but the throw back from second was late getting to Price who was covering. Guerrero’s dash to the plate surprised Price who threw just late to Kelly Shoppach at the plate as Guerrero slid around the tag for the run. The Rangers added two insurance runs off or Rays Closer Rafael Soriano when Ian Kinsler hit his third home run of the series a two run shot to make the score 5-1. The win was a triumph for the scrappy Rangers and a bitter disappointment for the Rays and the 12 disciples in Tampa that are their die-hard fans. The team will be certainly broken up was the payroll is slashed by a huge amount leaving free agents like Carl Crawford up for grabs. 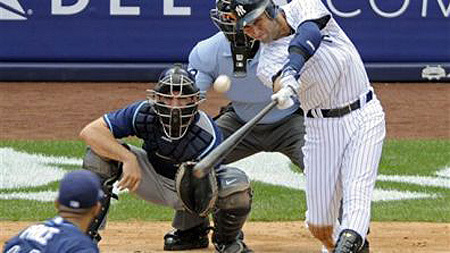 The Rangers move on the face the Yankees in the ALCS and this could be a much more interesting series than that played by the Yankees against their perpetual piñata the Minnesota Twins. Tomorrow or Thursday I should have my LCS picks out, I went four for four in the Divisional series so I hope to repeat my success with the same degree as I did last year. The Tampa Bay Rays after losing the first two games of their series against the Texas Rangers at the Trop have come back to even the series at two as they won game four of the series at Rangers Ballpark in Arlington. The Rays had excellent pitching from Wade Davis and the bullpen quartet of Randy Choate, Grant Balfour, Joaquin Benoit and Rafael Soriano which limited the usually hot hitting Rangers to just 2 runs on 8 hits. The Rays were lifted by the clutch hitting of Evan Longoria who broke out of his slump with a 2 run homer in the 5th inning off of Rangers’ starter Eric Holland. Carlos Pena and B.J. Upton add RBI doubles and the Rays were aided by an error by Ian Kinsler which allowed Carlos Pena to score in the 2nd inning. The Rangers offense was hamstrung by their inability to drive in runs when they needed them the biggest chance having the bases loaded in the bottom of the 5th with two outs but not scoring when Vladimir Guerrero struck out swinging to end the inning. The teams will now go back to Tampa and Tropicana Field for the finale of their series on Tuesday evening. 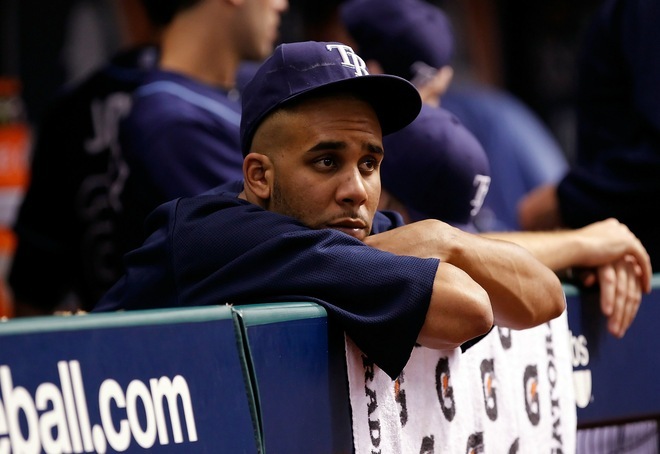 The Rays have the momentum; the Texas bench looked defeated on Sunday afternoon. 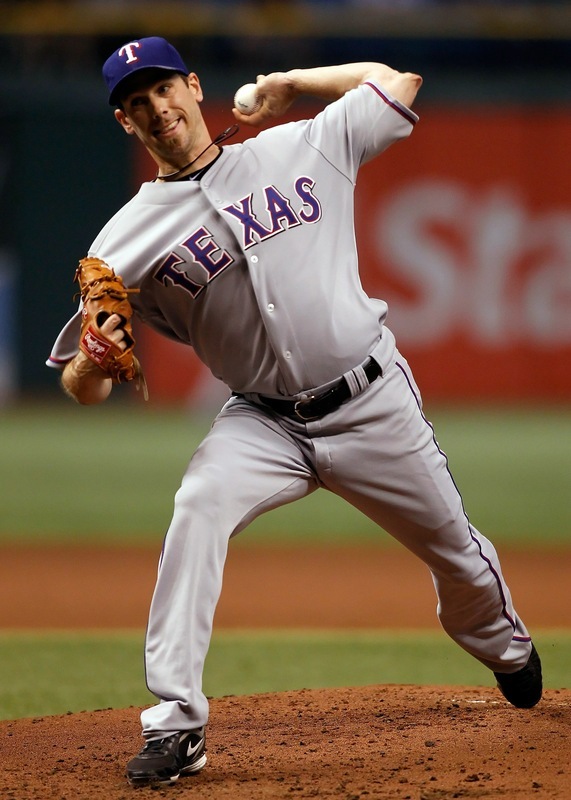 However, the Rangers will start Cliff Lee who held the Rays to one hit and a run in 7 innings work against the Rays in Game one. 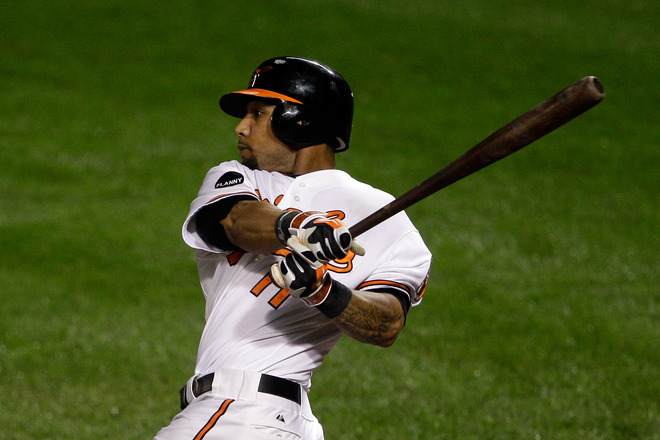 Lee will face David Price who gave up 4 earned runs including two home runs against the Rangers in game one. Momentum goes to the Rays, but the pitching edge goes to the Rangers. This one is anybody’s series to lose. 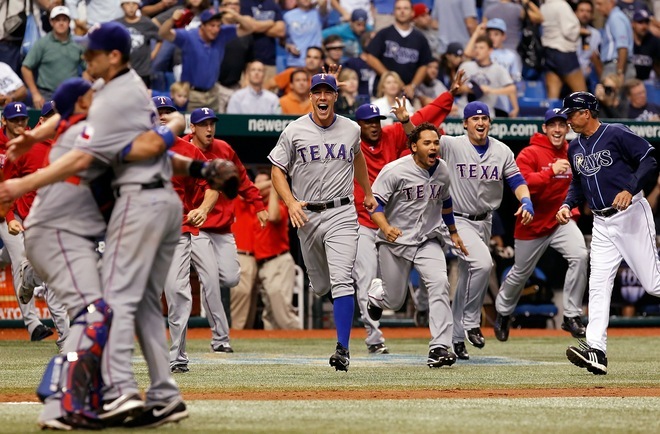 I picked the Rangers to win the series and still stand by that because of Cliff Lee. We’ll see if I am right on Tuesday night.